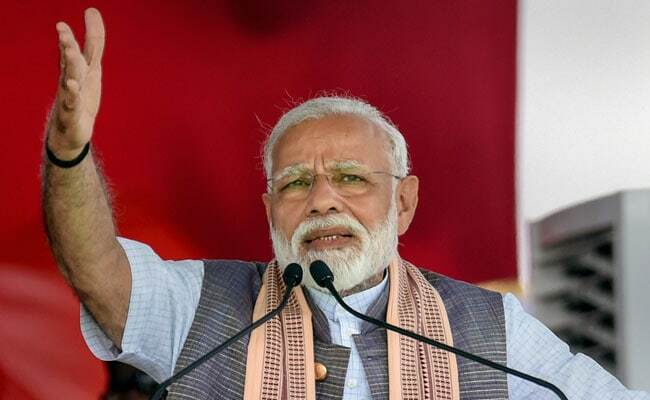 Lok Sabha Elections 2019: At a campaign rally at Surendranagar, PM Narendra Modi referred to the surgical strikes and air strikes by India inside Pakistan in response to terrorist attacks in Uri and Pulwama. Addressing three poll rallies in his home state, PM Modi also claimed that the then UPA government arrested BJP president Amit Shah and some police officers in Gujarat to topple the state government then headed by him. At a campaign rally at Surendranagar, PM Modi referred to the surgical strikes and air strikes by India inside Pakistan in response to terrorist attacks in Uri and Pulwama. "Earlier, terrorists from Pakistan would come here and go back after conducting an attack. Pakistan would threaten us, saying it has the nuclear bomb and will press the button (if India retaliated). "We have nuclear of nuclear bombs (the mother of nuclear bombs). I decided to tell them, do whatever you want to do (but we will retaliate)," the prime minister said. "In the past our people would weep, go around the world saying Pakistan did this, did that....It is now Pakistan's turn to weep. Didn't our jawans kill them by entering their houses? Shall we not kill them by entering their houses? Shall we not take revenge for our martyred soldiers?" he asked the large crowd which replied in the positive. "Today is Mahavir Jayanti, the day to observe peace. But when shall we have peace? Will anyone listen to a weak man making an appeal for peace or to the warning of a strong man who can flex his muscles? Only the peace appeal of a strong man will be respected, not that of a weak person," PM Modi said. He also alleged that the Congress spoke ill of the armed forces. "You must have seen how the character of the Congress party has changed in this election. The way the Congress spreads lies, and questions the country's military, saying its seniors are street goons, the Air Force chief is a liar...If you say something like this, will it not make Pakistan happy?" he said. PM Modi also slammed the Congress for seeking proof of action against terrorists. "When we conducted the surgical strike, Congress questioned us. When we conducted the air strike, it asked for proof. Do you (Congress) trust your own sons or Pakistan's rhetoric?" the prime minister said. Earlier, speaking at a poll rally in Himmatnagar, PM Modi said the then UPA government arrested BJP president Amit Shah and some police officers in Gujarat to topple the state government then headed by him. PM Modi also said this election will decide if nationalist forces will rule the country or those who want to help the "tukde tukde gang" by scrapping sedition law. "From 2004 to 2014, there was a ''remote control government'' and you know who was in control. In those 10 years, those sitting in Delhi tried to damage the interest of Gujarat and acted as if the state is not in India," PM Modi said. "Our police officers, and even Amit Shah, were thrown behind bars. They (UPA) employed all means to break the Gujarat government," PM Modi said, alluding to the time when he was chief minister of the state. "Now should we give them a chance to destroy Gujarat once again? They (Gandhi family) are more angry as they are out on bail. They are thinking that they were ruling this country for four generations and this Gujju, this chaiwala forced them to go to the court and seek bail," he said. PM Modi said if voted to power again, he will ensure that they are behind bars. "You gave me a chance in 2014. I brought them (Gandhis) to the doors (of jail) and if you will give me another five years, they will go inside, Modi said. "But if they come to power again, their first target will be Gujarat," PM Modi said. PM Modi asked the crowd if people of Gujarat approve the language being used by Congress president Rahul Gandhi against him. "The British used golis (bullets), while the Congress is using gaalis (abuse) against us," he said. "Initially, they said anything about chaiwala, then they started saying things about chowkidar and now they are saying the entire community is chor, PM Modi said. Later, at a poll rally at Anand, PM Modi claimed that the Congress always insulted Sardar Patel and is now crushing his ideology too. "Congress has stomach ache as the world's tallest statue is that of Patel," PM Modi said. Had Sardar Patel been the first prime minister of India, the country's situation would have been different, PM Modi said. "Congress operates through an eco-system by spreading lies. They will get a wrong story published in some paper. The next day, they will hold press conference," he said. "Congress people will spread the wrong news against the government in the entire country through those who work in their eco-system," he said. "They will then get someone to file a PIL in the court on this "fake issue" and top advocate-leaders of Congress party will argue for the PIL. This is happening very often now," PM Modi said.